At Texas Traditions Roofing, we’ll repair your roof right, the first time. After all, it is your home’s first line of defense against the elements. It protects your loved ones and property. But sometimes even the toughest roofs can’t stand up to Mother Nature, especially considering what she dishes out here in Central Texas. It can be upsetting to experience leaks or other roof issues following a severe storm. If you have a roof leak, call Texas Traditions Roofing for a free estimate for roof repair. Not all roofing problems are visible to the untrained eye, and many are missed by contractors who do not have advanced training in roof damage inspection and repairs. Texas Traditions Roofing‘s roof repair experts are Haag Certified Inspectors. A Haag Certified Inspector has in-depth training to spot roof damage. This extensive training includes a better understanding of the manufacture, installation and natural aging of a shingle. Plus, no roofing inspector is more qualified to spot hail damage or wind damage. 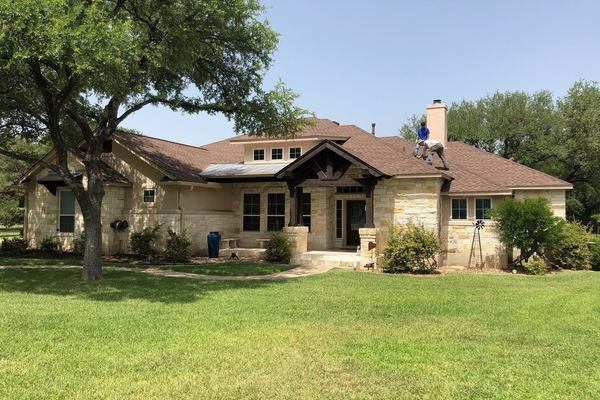 When you call Texas Traditions for a roofing inspection, you can take comfort that our inspectors will find the source of the leak or damage and fix it, no matter the roofing material. If your home or roof has sustained damage due to a storm or fire, we can help. We accept all insurance claims and because of our advanced Haag training, insurance companies trust that our assessment of roofing damage is accurate. We will let you know if your insurance company should cover roof repair or replacement due to the damage. Our experts will help make the process as smooth and stress-free as possible. Call Texas Traditions Roofing Today! Whether you have missing shingles, interior water damage, damaged flashing or skylights, or are experiencing other problems with your roof, Texas Traditions Roofing will identify the problem and provide a free estimate. We stand behind our work. If a roof leak re-occurs after we repair it, we will come back to fix it at no cost to you. Fill out our contact form or call us at (512) 415-4590 for your appointment.